It was the night after the 2016 US presidential election that I was seated around the dinner table with Palestinian, Syrian, and Yemeni friends, interspersing laughter and tears over a plate of delicately flavored Yemeni pulao. It was different from my grandmother’s Pakistani mutton version but comforting just the same. 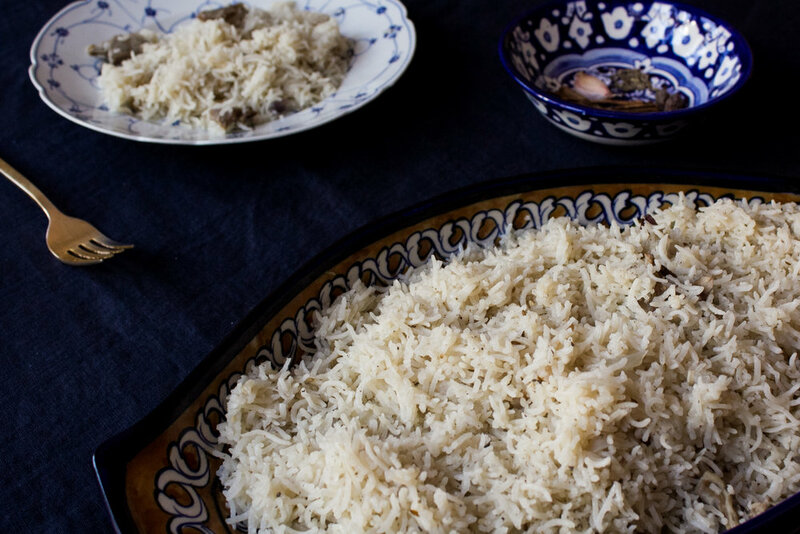 Mutton pulao is a quiet dish that dutifully appeared on my grandmother’s table during Eid. While my family never sacrificed a goat as is custom in Muslim countries during Eid ul-Azha, we always enjoyed it in the form of mutton pulao alongside cilantro and mint chutney, curried spinach, eggplant infused yogurt (“baingan ki borani”), and meat curry (“korma”). In appearance and taste, pulao can appear simple but those who cook it well know that its complexity comes from a gentle touch perfected over decades of practice. I would often think of mutton pulao when I moved to Washington D.C. from Pakistan in 2010. It was the year that my grandmother, Mommy, passed away. She was my last living grandparent, and, with her, I felt she took the last strain of history from a modern family with little patience for tradition. In her time Mommy too was modern. But she also came from a long line of storytellers. Her siblings and her (nine in total) were master orators. Through decades of narrating their family’s stories, they created among their grandchildren an understanding of history that was embedded in personal experience. In my immediate family’s case, that included American history. My grandparents had moved to Hyde Park in Chicago during the 1950s while my grandfather was getting his Ph.D. While his recollection of Chicago would center around how he was able to complete his Ph.D. in three years, Mommy would speak of her time in the U.S. with a strain of anger. She would always say, “Remember in America, you will always be a second-class citizen”. Maybe while my grandfather’s head was buried in books, Mommy was witnessing casual racism as she carted my father down in a stroller in leafy Hyde Park. She noticed the deeply segregated neighborhoods; overhead snide remarks about Muslims; struggled with orientalist commentary on why South Asians insisted on eating with their dirty hands. Growing up, Mommy’s stories seemed outdated. Her paranoia, misplaced. Like your typical white collar immigrant, I was naïve and optimistic about the arc of American progress. The results of the election, and now the events at Charlottesville have brought back Mommy’s words. Maybe I am not welcome here. Seeing my distress on November 9, my Yemeni colleague invited me over for dinner the where she had prepared her country’s version of pulao: beautifully prepared cumin-spiced rice topped with almonds. As the Palestinian, Pakistani, Syrian, and Yemeni laughed and cried about the election results in disbelief, we reminded ourselves that we had seen worse, and that we will overcome. By the end of the night, I could not help but smile. Maybe there was something to Clinton’s words when he said nothing wrong with America could not be cured by what was right with America. To me, that dinner was everything that was right with America. And of course, everything that was right with pulao. The mutton pulao recipe below is my grandmother’s recipe. It was shared with me by her home cook, Khalid. Boil meat in a large pot of salted water with black cardamom, cloves, cinnamon stick, cumin seeds, 2 sliced red onions and 1 tbsp. of crushed garlic. Bring to boil, cover pot and simmer on low heat till mutton is tender, about two hours. Once the meat is tenderized, remove the meat with a slotted spoon and set aside. Strain the bone broth and set aside. In a large pot, heat oil. Add the remaining sliced red onion, and sauté about 10 minutes on medium-low heat. Once the onion is evenly brown and soft, add crushed garlic and fry for a few seconds. Add the mutton and fry for 10 minutes on medium heat. Add 8 cups of the mutton broth. If you are short, add water. Check for salt, and bring to a boil. Add rice, and let the water boil out, about 5-10 minutes. Once the water boils out, wrap lid with a clean tea towel and place it securely on the pot. Let rice steam on very low heat for 10 minutes. Place pulao on serving platter and fluff with a fork. Serve with savory yogurt “raita” and spicy chutney.